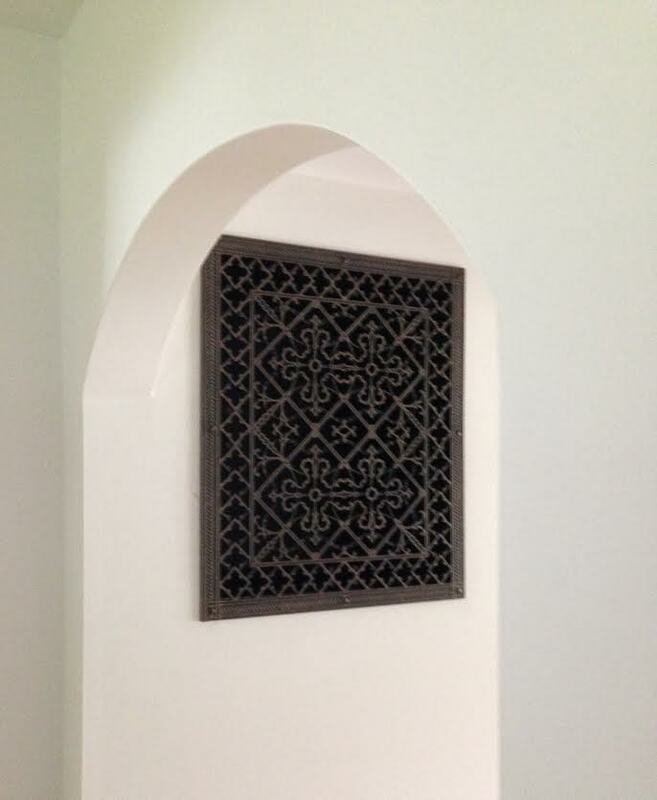 We love seeing our beautiful decorative grilles installed. Since we sell our products all over the world unless our customers send us images we don’t get to see them. We have started offering photography discounts so when you order inquire about our special offer for product photos. So thanks to our customers for sending us pictures. We particularly love getting a before and after. Australia filter grille installation without a door assembly. The knurled knob makes it easy to remove the decorative grille to change the filter. Pair of handsome 12″ x 24″ Arts and Crafts filter grilles. Wish I had a before shot of this. The wall looks great with the two decorative Arts and Crafts filter grilles. Close up of the detail on the Arts and Crafts Decorative Filter grille. No denying it is the most handsome solution in the market today. Before adding a decorative grille. The after picture needs no explanation. Arts and Crafts 24″ x 30″ in Dark Bronze finish. Las Vegas Wedding Chapel with speaker grilles, Louis XIV decorative ceiling grilles and decorative recessed light trims. Beaux-Arts Classic Products offers handsome alternatives to otherwise unattractive industrial elements found in all homes and businesses. Our products enhance most decors. We are currently working on a Roman style grille which will be terrific in contemporary interiors. Coming soon! !